Airs Sunday, August 26, 2018, at 6 p.m. The high-profile deaths of fashion designer Kate Spade and celebrity chef Anthony Bourdain have brought the issue of suicide into the national spotlight. Suicide is the eleventh-leading cause of death in Louisiana and third among 15 to 34-year-old residents. Sixteen percent of Louisiana’s 677 suicides in 2016 were military veterans. So, how is Louisiana addressing its suicide problem? What signs should friends and family members look for to prevent someone from taking their own life? And what assistance is available to help individuals from going down that path? 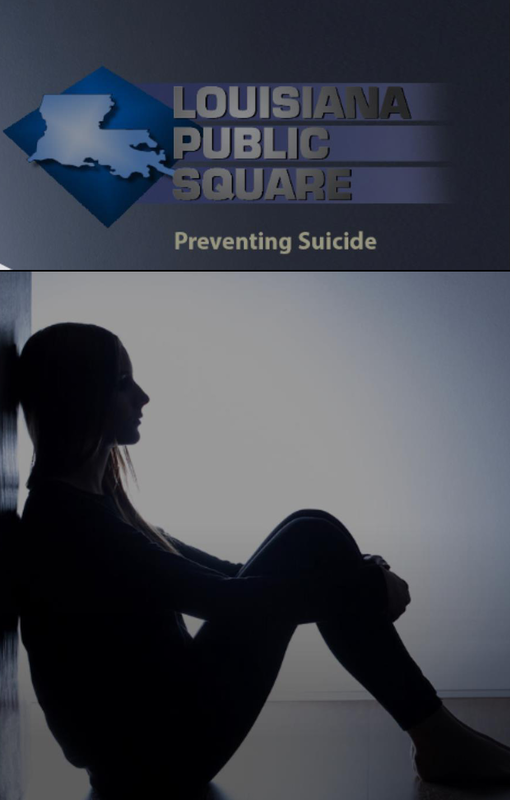 Louisiana Public Square looks for answers to these questions and more on “Preventing Suicide.” Our panelists are:• Cynthia Elmer; American Foundation for Suicide Prevention, La. Chapter • Danita LeBlanc, LCSW-BACS; Louisiana Department of Health• Tonja Myles; Suicide Survivor and addiction Recovery Advocate • Raymond Tucker, Ph.D., LSU Mitigation of Suicidal Behavior Laboratory The program features interviews with Emma Benoit, a suicide survivor; Frank Campbell, Ph.D., a forensic suicidologist; April Foreman, Ph.D. with Southeast Louisiana Veterans Health Care Systems, and Barney Lejeune, with Jacob Crouch Suicide Prevention Services. LPB CEO, Beth Courtney and LPB news anchor, Andre’ Moreau host the episode.